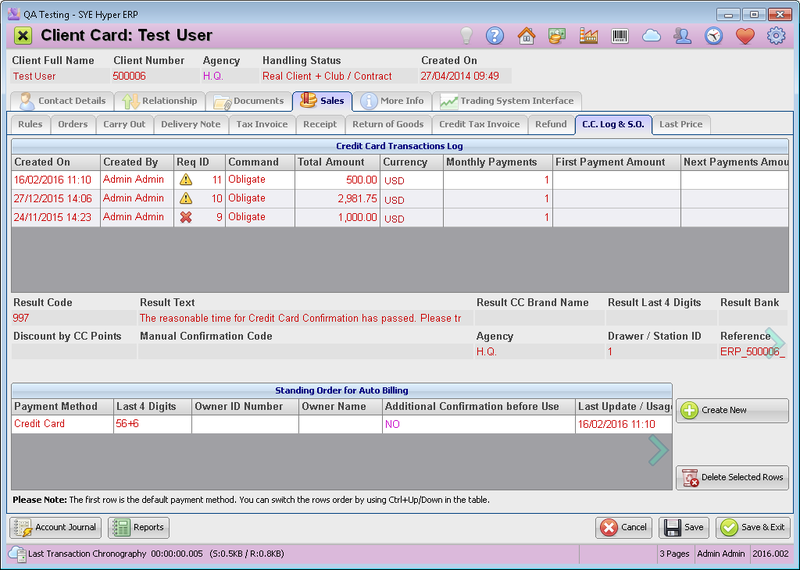 This tab displays the history of the Credit Card transactions as well as the standing orders for Auto Billing. Hyper executes an accounting action for every billing / refund if a credit card. Each credit card transaction is saved in the data base with no credit card or account details. The system deletes the credit card details on a daily basis and keeps only the last four digits of the number. As part of Hyper's high level of data security, all of the accounts and credit cards details are encoded according to the DSS regulation and rules (448 bit encryption). Additionally, Hyper's data base is located separately from the systems servers and operating computers. Credit Card Transaction Log - The information fields of this table display the credit card transactions details. Additional information about the selected record in this table is presented at the bottom of the table. Standing Order for Auto Billing - This table includes the credit cards and the bank accounts for auto billing and allows to add additional credit cards and bank accounts details. - The transaction was successfully executed. - The transaction was failed. Point this symbol to display the reason for the transaction failure. No answer was received from the clearing program. Check the internet connection and contact the support service. Point this symbol to display the reason for the transaction failure. Additional information as well as the result text for the selected record in the table, is displayed at the bottom of the table. Delete Selected Rows Delete the selected row and the payment method. These payment method will be used for Auto Charging, from the Bookkeeping Module.